I'd say this pretty much sums up my evening. 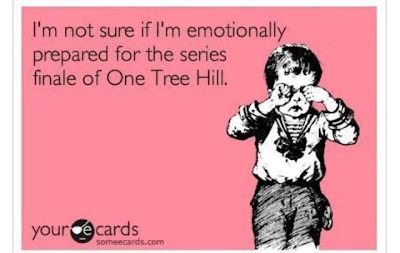 Thanks, OTH, for the last nine years. You've introduced me to great music, more drama than I'll ever hope to experience in a lifetime, and the best quotes ever. I really want to get the DVDs and start watching this show...I've heard such great things about it. I loved OTH for about 7 years but stopped watching the last two season or so. I'm guessing that it would good enough to rent the DVD's? Missy, the last episode was AMAZING! But you're right: after the season 6 when Lucas and Peyton left it was not nearly as well written or acted. But I still LOVE it! OE: It was a GREAT show! High suspense, great music, good stories. Def check it out! I only watched the first two seasons. And I've caught a few episodes after that. I didn't realize they were still making new ones! One day I would like to catch up on them all.